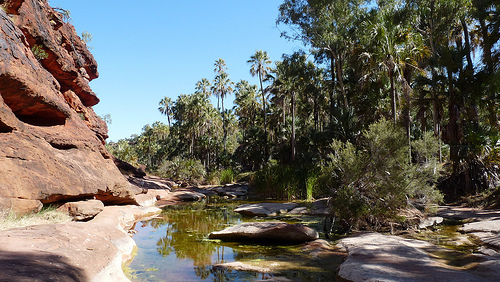 Finke Gorge is a beautiful remote national park. 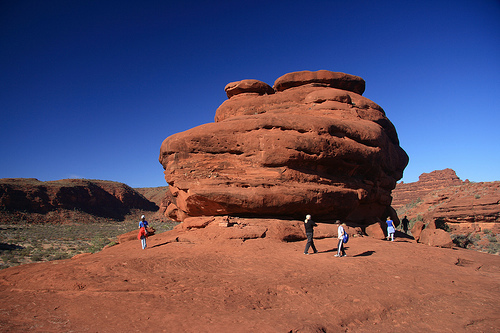 This 46,000 hectare national park 138km west of Alice Springs in Northern Territory, is one of the remotest Australian national parks. 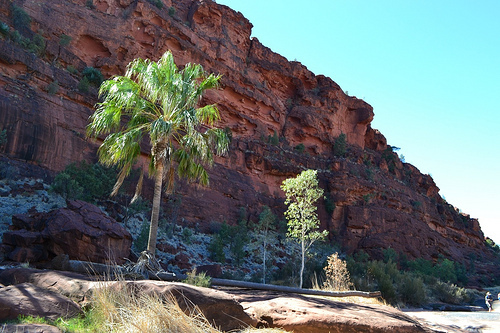 It is a great park to camp and 4WD, with its beautiful gorge and Palm Valley, famous for its rare Red Cabbage Palm Trees. To get to the park, drive the Larapinta drive west of Alice Springs, which also goes to the West MacDonnell Ranges. Where Namatjira Drive turns right to the West MacDonnells, keep going south along the Larapinta trail, until you come to the historic town Hermannsburg. 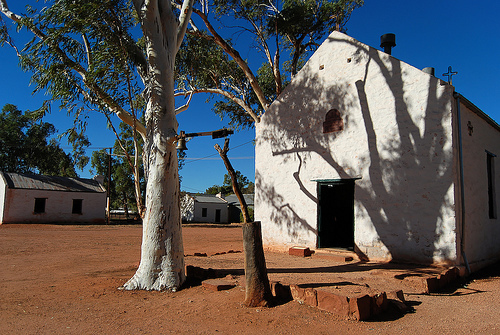 Hermannsburg is an old mission station established by Lutherans. Many Aboriginal People were baptised here, including the famous artist Albert Namatjira who painted some impressive paintings of Central Australia. Many historic buildings remain today such as a school, a church and a mess house. The church is now a museum, and there are also some old artefacts on display in the Tea Rooms, the only eatery in town. 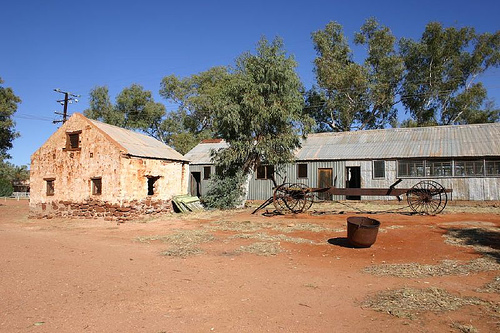 Hermannsburg is today an Aboriginal community and it is ok to have a look at the historical buildings but the local council asks you not to enter the Aboriginal community. South of Hermannsburg there is the Finke Gorge 4WD Route which takes you to Finke Gorge. The last 16km is 4WD road only along the bed of Finke River that can be flooded after rains. There is a swimming hole, camping site and a few bushwalks at Boggy Hole; and east from there are the ruins of an old police station. Back in Hermannsburg, there is another turnoff west of the town which takes you to the lovely Palm Valley. This is also a 4WD road, which goes mostly along the Finke River bed. After the river bed ends, the road turns west and you come to Kalarranga carpark, and the start of Mpaara Walk, which is a two-hour return walk where you can follow the Mpaara Dreaming story of Arrernte Aboriginal people. It’s a nice walk and there are also some good views. Further along the Palm Valley road there is a short walk to Kalarranga Lookout; and after that you come to a campground with picnic tables, barbeques, toilets, showers and drinking water. Further towards Palm Valley is another picnic area, before you finally come to the Palm Valley carpark (where there are no facilities). Two walks start here. The shorter, Arankaia Walk, is only 2km long, easy walk along the creek bed with good views of the cabbage palms and some birdlife in the early mornings and late afternoons. The longer, 5km Mpulungkinya Walk, takes you around in the Palm Valley which is absolutely gorgeous. 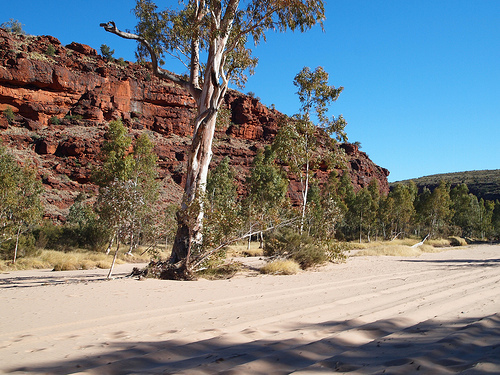 There are camping fees payable in Finke Gorge National Park (at the camping sites), but they are cheap. The only place to eat is Hermannsburg Tea Rooms, so bring your tucker with you. Here's a map of Finke Gorge National Park, where I have tagged the places that I mentioned on this web page. You can click on the tags to see what places they are, and double-click anywhere on the map to zoom it in and see the places closer. Drag the map to move around, and if you want to see the satellite image with Google Earth, click on "Sat" in the top right hand corner. 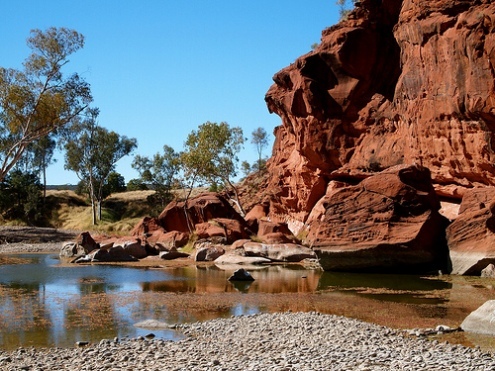 Been to Finke Gorge National Park?